It’s Black Friday but that’s not the end of the deals. 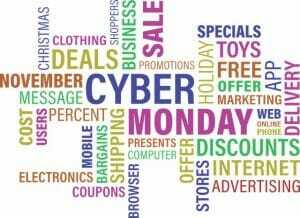 A tradition that started in America but is now huge in the UK, Cyber Monday is the first Monday after Black Friday. Cyber Monday is a whole new round of discounts and sales focussed on technology and gadgets online. If you’re looking for a new computer or mobile phone, you might find the best deals on Monday. In reality, most discounts are available all weekend. Some retailers like Curry’s offering deals over two whole weeks! Read on for our top tips for getting the most out of Cyber Monday. The same tip applies as on our Black Friday tips, make a list of what you’re looking for before the sales start. The easiest way to spend too much and blow your budget is to get distracted by all the shiny things on offer. If you make a list, record the cheapest price you can find before the sales start to make sure it’s really a bargain. Write down what you’re prepared to pay and when you see that price, buy. There will be other sales and 2017 models will be discounted in the new year again and possibly by more. When it comes to gadgets, the best deals will be on the last model as manufacturers get ready for launching the 2018 version! Technology is now so advanced that nothing has really changed so for most people, the current or last model is fine. There’s no point taking out bad credit loans when times are hard just to get the latest 65″ Ultra HD TV when the same model from last year is just as good. Lot’s of retailers run lightning deals where you only have minutes or an hour to buy. Sometimes those deals are really good value but they use the time limit to make you buy quickly without doing research. It’s always worth having a quick search around to see if that’s the best price. Some deals are not deals at all. Always read the product reviews, a lot of sales are for items that didn’t sell well. The retailer is trying to get rid of stock before the new model and they have too much. The reason they have that stock is often that the product is flawed or has a lot of faults/customer returns. The reviews on independent sites are great but if you can’t find any review sites, try finding the product on Amazon. The reviews on Amazon are usually pretty honest and there are generally a lot of them. If it’s a dud product, you’ll soon find out. Remember you always have the right to return unopened products when buying products online. This rule is under the Distance Selling Regulations. As a minimum, all retailers have to allow you 7 days to cancel an order, this isn’t the same as returning the item for which you generally have longer. Most things can be returned with some exceptions like underwear, earrings and perishable goods. If you’ve bought something and realised the price wasn’t right, cancel the order and return the item. Pick up some bargains this Cyber Monday, just don’t break the bank and spend too much.